So with our set of points on a curve (plus the special point, infinity) we can start doing some useful. First of all we pick a point on the curve called the '''generator''' (we'll call it g). 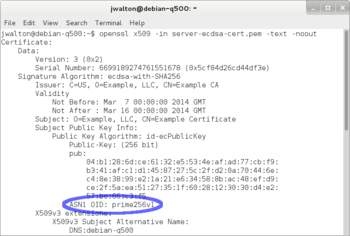 Fortunately unless you are defining a new curve (not recommended unless you know what you are doing), or you are using an unusual curve that OpenSSL does not have support for, you can usually utilise one of the '''named''' curves that are built-in to OpenSSL. These are a set of well known and widely used curves. The complete collection of curve parameters can be set in one go simply by selecting the appropriate named curve. 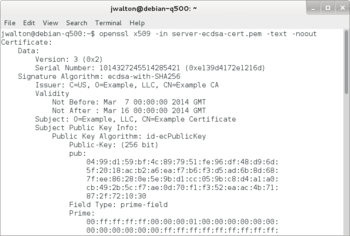 Keys for ECDH and ECDSA are represented using an EC_KEY structure in the low level EC API. If you are using the preferred high-level [[EVP]] API then this EC_KEY structure will be wrapped in an [[EVP#EVP Working with EVP_PKEYs|EVP_PKEY]] object.